IT HAS BEEN A FEW YEARS SINCE WE DID A ROAD BREAK IN TO EDEN LAKE WHICH IS 13 KMS OF BUSH ROAD. 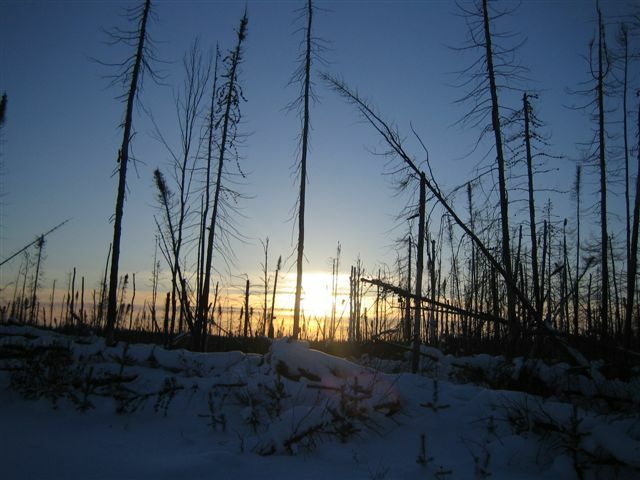 THERE WAS A FOREST FIRE IN 1998 WHICH BURNED THIS AREA WHICH MADE THE TREES READY FOR LOGGING. THE LOGGERS HAVE 3 YEARS TO GET THE BURNT TREES OUT OF THE BUSH BEFORE THEY ARE NO GOOD FOR FORESTRY PRODUCTS. 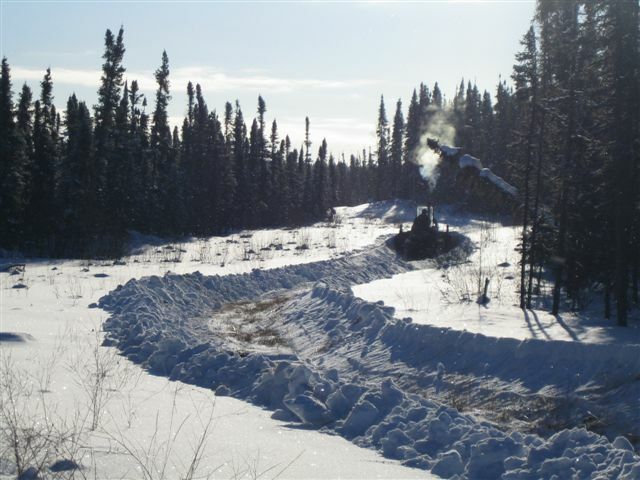 IN 1999 THE WETTEST YEAR ON RECORD BEFORE THE SUMMER OF 2005, WE HAD A CONTRACT TO PUT IN A ROAD FOR THE LOGGERS. 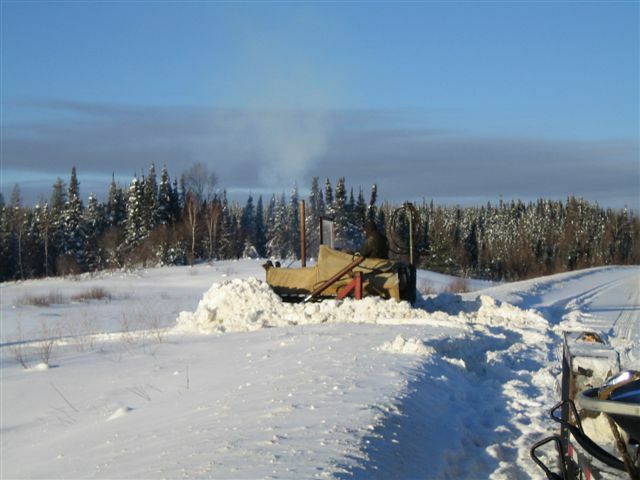 IT WAS TOUGH, WE SUNK SKI-DOOS IN THE SWAMPS TRYING TO PACK THE SNOW BUT WE HAD TO GET AN EARLY START. ONCE THE GROUND HAD FROZEN ENOUGH WE WERE ABLE TO GET THE "FAMOUS BLACK CAT" TO DRAG THE ROAD AND THIS SLOWLY WORKED THE GROUND HARDER AND HARDER WITH MORE FREEZING. BUT WE ALSO SUNK THE "FAMOUS BLACK CAT" A FEW TIMES TOO. THE FIRST WEEK IN JANUARY 2000 THE ROAD WAS OPEN AND THE LOGGERS WERE HAULING SUPER "B" LOADS OF LOGS OVER A ROAD THAT WAS BASICALLY WATER 2 MONTHS BEFORE. NOW 63 METRIC TONS WAS BEING SUPPORTED BY ROCK HARD FROZEN GROUND ALL BECAUSE WE WORKED IT TO GET THE FROST DRIVEN IN. 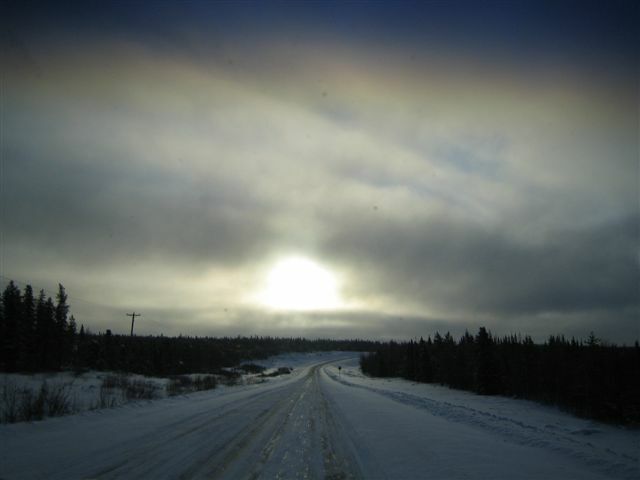 NOW IN 2006 WE WILL OPEN THE ROAD AGAIN BUT THIS TIME RARE EARTH METALS FROM VANCOUVER BC WHO WANTS TO DIAMOND DRILL WHERE THE LOGGERS LOGGED. THE WINTER CONDITIONS ARE TOTALLY WAY OUT IN LEFT FIELD WITH NO REALLY COLD DAYS AND LOTS OF SNOW. WE HAD THE WETTEST SUMMER ON RECORD AND THEN TO FOLLOW BY SNOW EVERYDAY. SO THE WET GROUND IS NOT FREEZING DUE TO ALL THE SNOW ACTING LIKE A BLANKET OF INSULATION. SO WE HAVE TO GO OUT AND PLOW THE SNOW OFF THE ROAD BUT NOT SINK THE CAT. ONCE THE SNOW IS OFF THE GROUND SHOULD FREEZE WHEN THE COLD WEATHER COMES. SO TO CHECK OUT THE MINING COMPANY AND IT'S PROJECT ON EDEN. 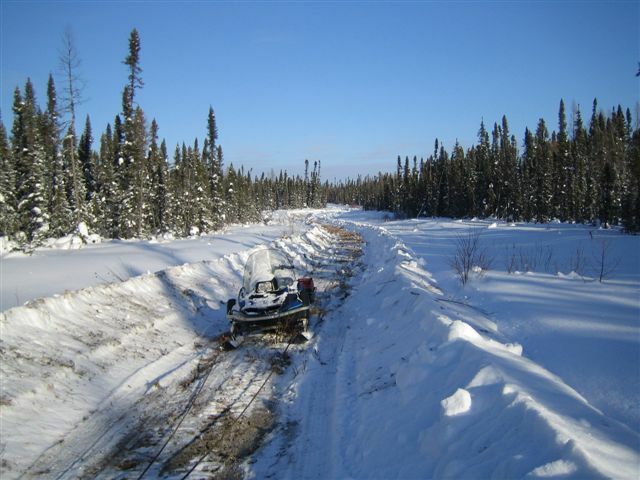 WE LOADED UP THE SKI-DOO AND THE TD-6 KNOWN AS "KOMMUNIST KAT" AND HEADED TO EDEN LAKE TO START THE ROAD BREAK. 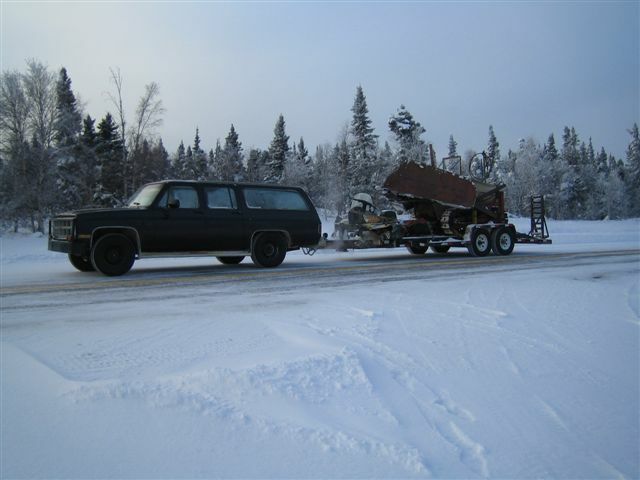 THE SUBURBAN KNOWN AS "CHROMELESS" DID VERY WELL HAULING THE LITTLE CAT. OF COURSE SOUTHERN BELLE HAS TO TAKE A FEW NATURE SHOTS OR JUST TO SHOW YOU WHAT THE SO CALLED ROAD TO CIVILIZATION LOOKS LIKE. 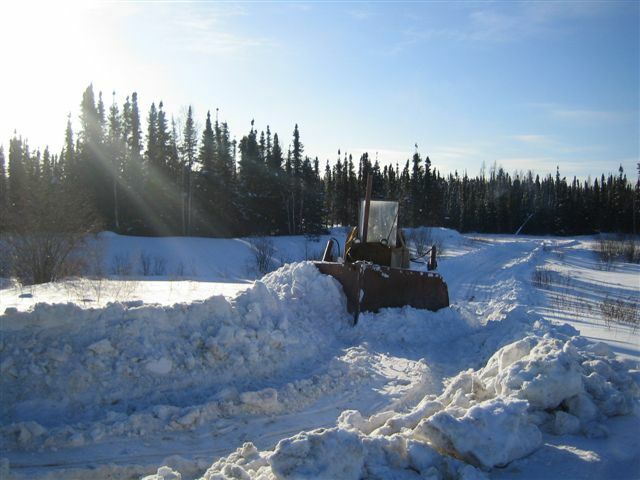 WHEN WE ARRIVE THE FIRST THING TO DO IS PLOW THE ACCESS ROAD OFF THE HIGHWAY SO WE ARE NOT OUT PLAYING IN THE TRAFFIC. TALK ABOUT SNOW, I HAVE NEVER PLOWED THIS MUCH AT EDEN BEFORE. 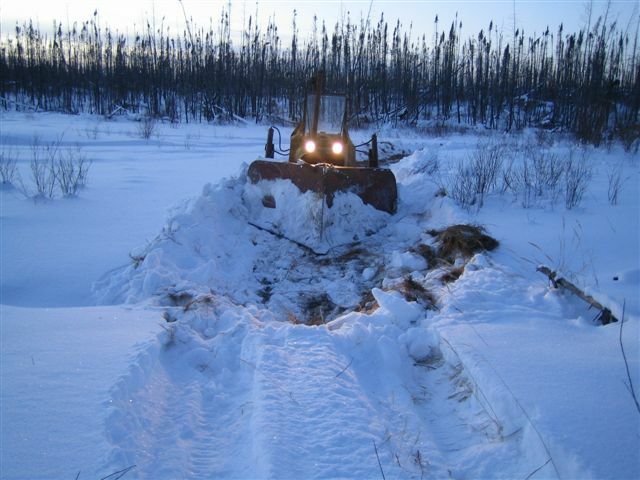 OFF I GO ON "KOMMUNIST KAT" PLOWING A TRAIL, BUT THE SNOW IS SO DEEP THAT IT IS FLOWING IN BEHIND THE CAT. NOW CHROMELESS CAN'T FOLLOW THE CAT. I ENDED UP MAKING 3 PASSES TO GET THE TRAIL WIDE ENOUGH TO TRAVEL ON. TALK ABOUT SNOW THAT IS JUST LIKE SUGAR. BEHIND CHROMELESS WE TOW THE STUPID SKI-DOO IN NEUTRAL IN CASE WE HAVE TO DO A LITTLE SCOUTING. BUT I HATE THE SKI-DOO AND THE LESS I RIDE IT THE BETTER. 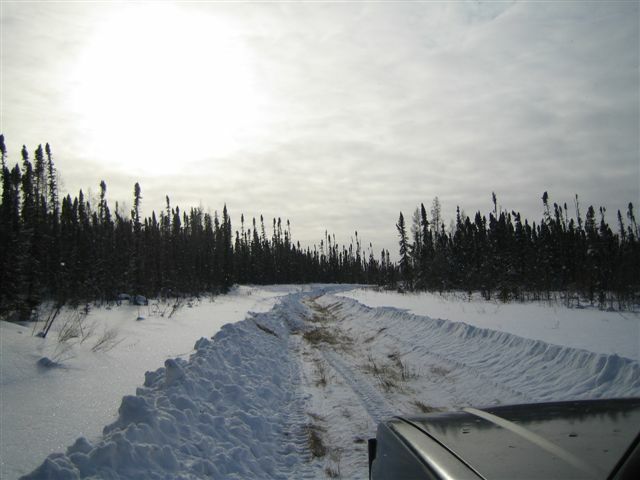 THE TRAIL IS PLOWED TO THE GROUND SO IT WILL FREEZE UP GOOD PLUS WHEN I DRIVE THE CAT BACK TO THE HIGHWAY FOR THE NIGHT THE TRAIL GETS WIDEN MORE. EVERYTHING WAS GOING WELL UNTIL I FOUND THE SPOT WHERE I SUNK THE FAMOUS BLACK CAT A FEW YEARS AGO. BUT THIS TIME I WAS ABLE TO GET "KOMMUNIST KAT" OUT AND PLOW AROUND THE WATER. NEXT I CAME UP TO MY FAVORITE CREEK WHICH HAS LOTS OF WATER IN IT THIS TIME. MOST YEARS IT 3 FEET OF WATER AND SNOW ON TOP. THIS YEAR WATER TO THE TOP AND NOT FROZEN. TO WALK ACROSS TO GET THIS PICTURE I GOT WET BECAUSE IT WAS NOT FROZEN ENOUGH TO SUPPORT MY WEIGHT. 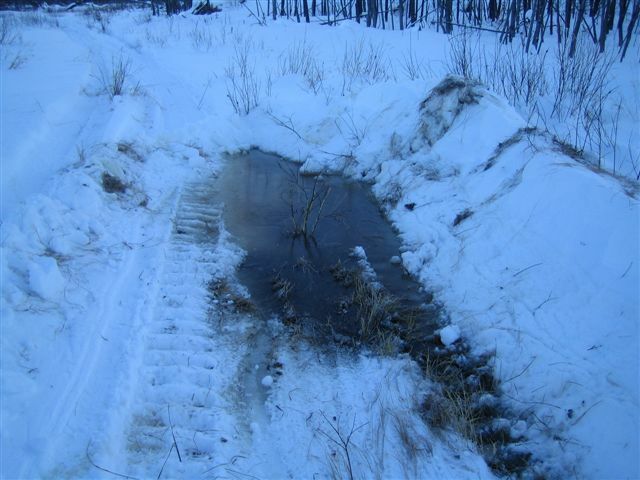 MY 6 FOOT BAR SHOWS YOU THE DEPTH OF THE UNFROZEN LITTLE CREEK, I DIDN'T SHOVE IT ALL THE WAY IN BECAUSE I NEED THAT BAR FOR CHECKING MORE BAD SPOTS, LOL. 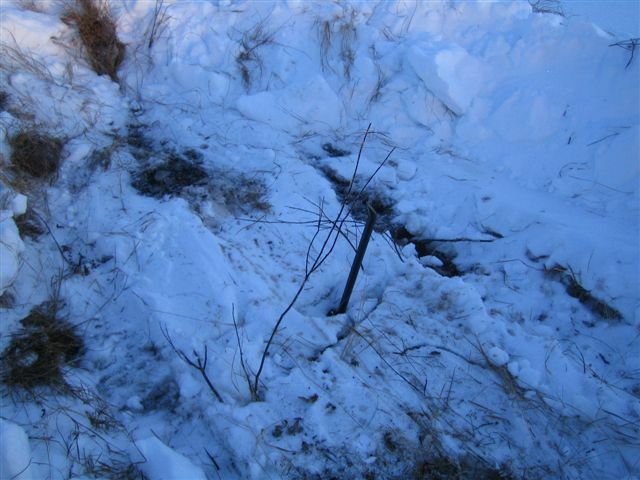 I TOOK THE "KOMMUNIST KAT" AND BUSTED THE CREEK ALL UP SO IT WILL FREEZE. IF I DIDN'T DO THAT THE ONLY THING YOU WOULD SEE OF "KOMMUNIST KAT" WOULD BE HIS TAIL.